According to the U.S. Centers for Disease Control and Prevention: One-fourth of Americans aged 65+ falls each year. Every 11 seconds, an older adult is treated in the emergency room for a fall; every 19 minutes, an older adult dies from a fall. Fall prevention is one of the most overlooked risks or potential health hazards for seniors. Most of the time these falls come with limited risk, and even sometimes make for a great story. As we age however, our bones become more brittle, muscles heal slower, and bruising happens a lot easier. Having a fall later in life suddenly becomes a very serious health risk that can lead to broken bones, limited mobility and in some cases death. Affordable Home Care takes these risks very seriously and has a dedicated fall prevention program that evaluates every day risks enabling our CNA’s and caregivers to provide the best possible support to keep our clients and your loved ones safe and on their feet. Fall risk can come from both external and internal factors. External factors can include doorway thresholds, floor mats, wet surfaces, clutter, and low visibility. A lot of us have these ever day obstructions in our homes, but we don’t consider the risks they present to the health of an elderly person. Many seniors also have internal factors that contribute to a fall. Factors such as poor vision, low endurance, limited strength & mobility, and sometimes even conditions or diseases like Parkinson’s or MS. These internal factors combined with environments full of obstacles can really make it difficult for a senior to manage safely day to day. 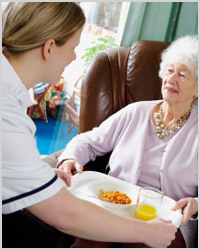 Affordable Home Care’s fall prevention program helps mitigate these risks.